What is AIDL in android? AIDL is Android Interface definition language to establish the communication both application that running at different process. The communication is using IPC inter process communication which allow the process communicate together. In Android OS, different process cannot access to another process. Therefore, Android was solve this problem by using AIDL convert the object to primitive so that the Android OS will understand. It also name as remote service. 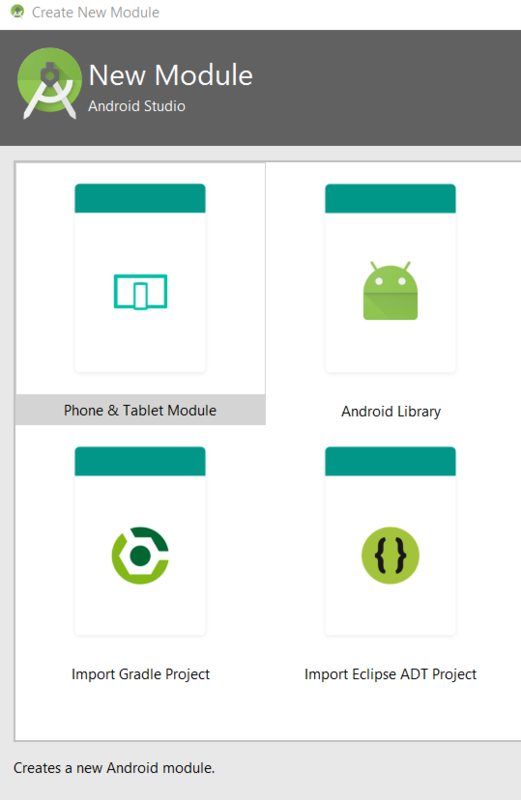 In this tutorial, i will give you the example and show how the its work in android. It is just easy if you can understand the process. 2. Create a new project and Edit the Application name to “AIDL_SBServiceExample”. Create a new service in your package name by right click > Add > Service > Service. Enter the Service name as “AIDLService”, after that click OK button. 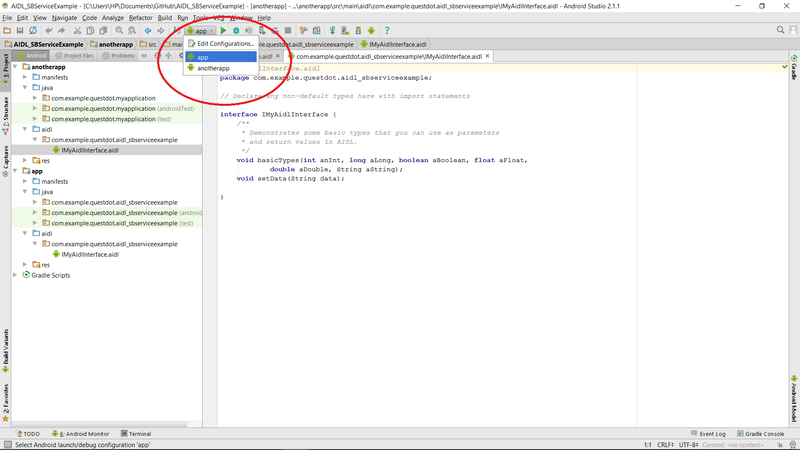 Once service class created, you will see <service> is include in your AndroidManist.xml. 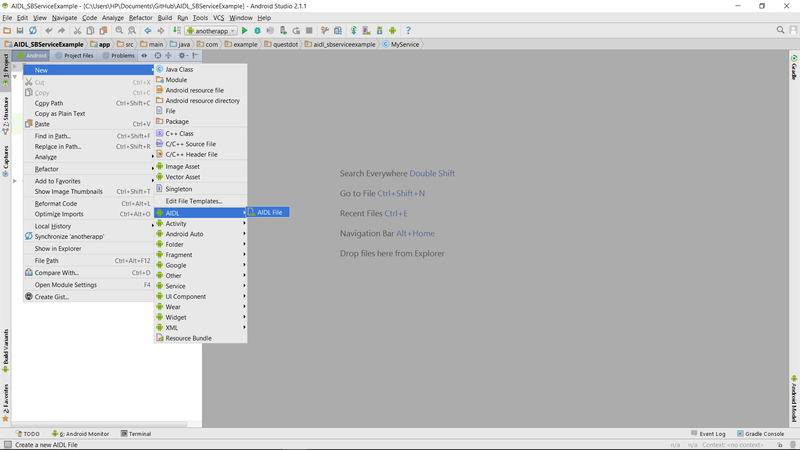 To add a aidl interface by right click the package name > New > AIDL >AIDL File. The aidl default name is IMyAidlInterface you can change it or let it default. After that click finish button. After that, it will automatic generate the aidl package for your aidl file. Open your IMyAidlInterface.aidl in your aidl package and insert the following code. After that, go to your AIDLService.java add the following code. Create a new module name “anotherapp” to start, bind and syn data to the module “app”(service). Different module is a different application, so they have different process. The module “anotherapp” is to connect the service from the “app” module. 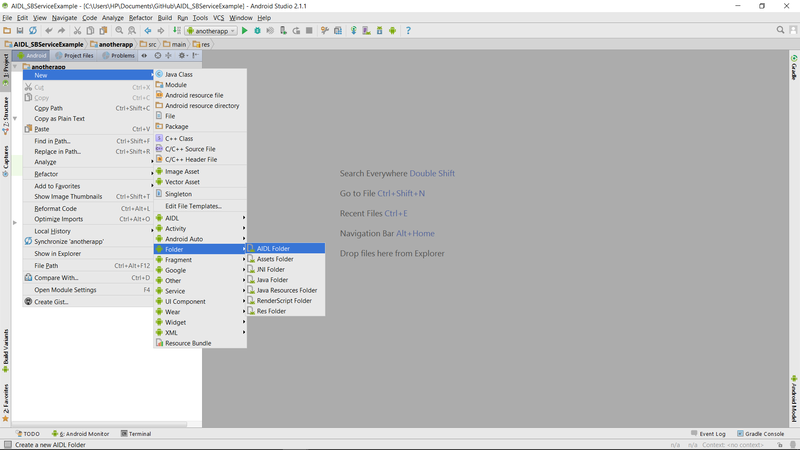 To create a new module, in the topbar click File > New > New Module. It will pop out a task, select Phone and Tablet Module, Next and pick the Empty Activity finally finish. 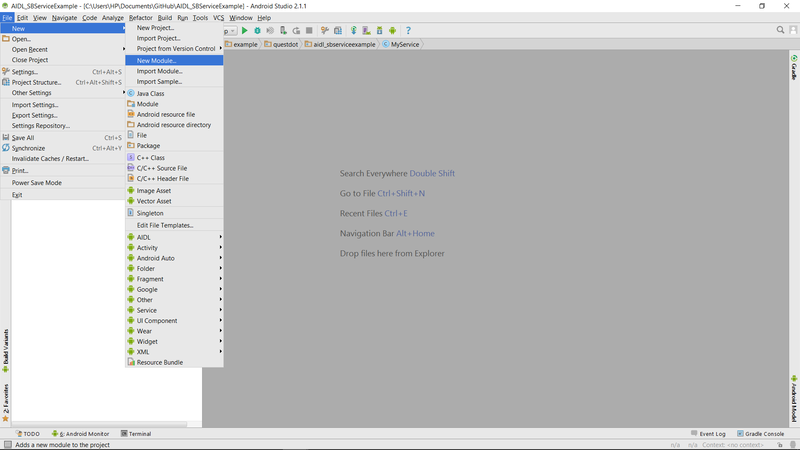 In the “anotherapp” module, go to the activity_main.xml in the layout folder edit the source code. In the “anotherapp” module add a new aidl folder. 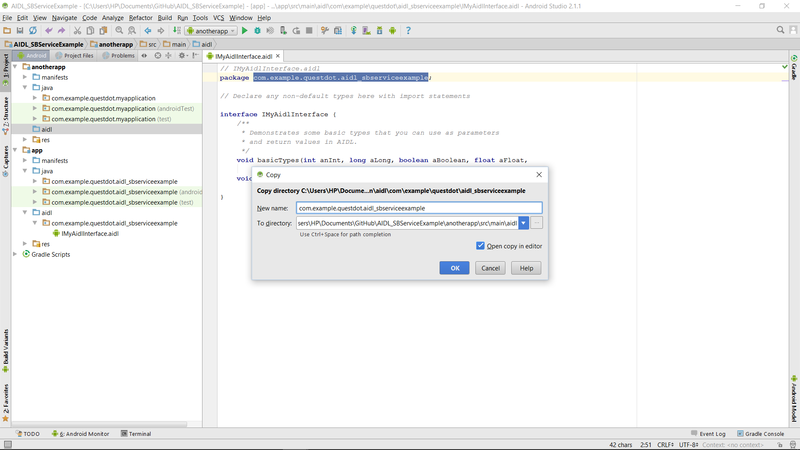 Copy the aidl package in the “app” module and paste it in your aidl package in the “anotherapp” module. The package name and aidl file name should same as module “app”. In the module “anotherapp“, go to the MainActivity.java and add the following code. You need to start the module “app” first, after that that only start the module “anotherapp” to test the service in your device. Yes… you just done this project. You can test out the application and understand how its work.